FOOTWASHERS WANTED - APPLY WITHIN! So, why do we need foot washers? Surely everybody can shower before they come to church and put on clean socks. Well let’s look at this job opportunity together. We all will remember the story of Jesus washing His disciple’s feet in the upper room according to John 13. This happened just prior to the Last Supper. Now it is often said that while 1 Corinthians 13 records the most supreme description of love, John 13 records the most supreme example of love. Pick up on the love and humility of Christ as we read. Let’s read the section together. John 13:1-17 (ESV) 1 Now before the Feast of the Passover, when Jesus knew that his hour had come to depart out of this world to the Father, having loved his own who were in the world, he loved them to the end. 2 During supper, when the devil had already put it into the heart of Judas Iscariot, Simon’s son, to betray him, 3 Jesus, knowing that the Father had given all things into his hands, and that he had come from God and was going back to God, 4 rose from supper. He laid aside his outer garments, and taking a towel, tied it around his waist. 5 Then he poured water into a basin and began to wash the disciples’ feet and to wipe them with the towel that was wrapped around him. 6 He came to Simon Peter, who said to him, “Lord, do you wash my feet?” 7 Jesus answered him, “What I am doing you do not understand now, but afterward you will understand.” 8 Peter said to him, “You shall never wash my feet.” Jesus answered him, “If I do not wash you, you have no share with me.” 9 Simon Peter said to him, “Lord, not my feet only but also my hands and my head!” 10 Jesus said to him, “The one who has bathed does not need to wash, except for his feet, but is completely clean. And you are clean, but not every one of you.” 11 For he knew who was to betray him; that was why he said, “Not all of you are clean.” 12 When he had washed their feet and put on his outer garments and resumed his place, he said to them, “Do you understand what I have done to you? 13 You call me Teacher and Lord, and you are right, for so I am. 14 If I then, your Lord and Teacher, have washed your feet, you also ought to wash one another’s feet. 15 For I have given you an example, that you also should do just as I have done to you. 16 Truly, truly, I say to you, a servant is not greater than his master, nor is a messenger greater than the one who sent him. 17 If you know these things, blessed are you if you do them. My normal tendency will be to do a full exposition on the text, and we could easily spend four to six sermons on this section, maybe even more, as there is so much here regarding Judas, and especially the comment of Jesus, that they all are clean except for one of them. However I want to piggy back on our sermon series, ‘what’s love got to do with it’, and share some practical thoughts to one issue from this text that is close to my heart. There are three thoughts at play here which I want to look at. Firstly I want to focus on what it meant for Christ, namely a display of His humility and servant hood. Then I want to look at what it meant for the disciples and how it related to their heart attitude at that time. Then lastly I want to stand still for a few moments and look at what it means to us as it becomes a symbol of our care and service towards one another in the body of Christ. Point 1. For Jesus, a display of His humility and servant hood. We all know the context of foot washing in Biblical days and specifically here in Palestine. They were a community of people who did not own bicycles or cars like we do, and many of them did not own even a donkey. So, most of them would walk wherever they wanted to go. Now, we must remember that these were dusty roads that they walked on and none of them had closed shoes. All they had was sandals. Their practice was that feet had to be washed before people reclined for a communal meal. They did not all sit on chairs like we do and would often recline around a low table simply sitting on a mat. So their feet were exposed to one another. Now in some cases they would wash their own feet, in other cases their feet were washed by the lowliest of servants. Such a servant was normally a gentile as a Jew could not be forced into that position. So, when Jesus rose from the table and began to wash the feet of the disciples as if He was the lowliest of servants, He was doing that as a Jew, as a Rabbi but more than that, he is the creator of the universe. Now, remember that the disciples did not have the New Testament text as we have it, so this action of Jesus must have stunned them out of their very sandals covering those dirty feet. This act of Jesus was an act of humility and condescension, and it would have been much more appropriate if they actually washed Christ’s feet. Surely, He was their Lord and Master and now He is acting as if He is the servant. The image of Christ with a basin of water and a towel is the last image you would have expected from the life of the King of Glory and the Messiah of the Jews and ultimately the King of the universe and all mankind. Yet this act of humility foreshadowed His ultimate act of humility on the cross and has become a symbol till this day of humility and servant hood. I cannot end this point without reading verses 3 – 4 again: “3 Jesus, knowing that the Father had given all things into his hands, and that he had come from God and was going back to God, 4 rose from supper. He laid aside his outer garments, and taking a towel, tied it around his waist.” This statement paints the picture. Here the one who came from God and had all things given by the Father into His hands takes up the towel to wash feet. I will get to us later, but oh how we must learn from His example. Point 2. For the disciples – a lesson in contrast to their attitudes. The act of Christ was in direct contrast to the attitude of the disciples as well as in direct contrast to what we see in the world today, even among believers. Now, I am not sure what kind of songs they sang, but would they not just like us so easily sing ‘brother let me be your servant, let me be as Christ to you’, and then not mean it. Let’s be honest not too long before this event we find an interesting story in Luke 22:24 (ESV) “24 A dispute also arose among them, as to which of them was to be regarded as the greatest.” Jesus actually asks them a profound question in Luke 22:27 (ESV) “27 For who is the greater, one who reclines at table or one who serves? Is it not the one who reclines at table? But I am among you as the one who serves.” This again refers to the servant hood of Christ which was so unlike that of His disciples. Then Jesus said something that must have further shocked Peter in verse 8: “If I do not wash you, you have no share with me.” prompting Peter, whose love for the Saviour was genuine, to request a complete washing, not just his feet. If feet washing meant a partnership with Christ, let’s go the whole hog. Then Jesus explains that this is not just a demonstration of servant hood but it is also a demonstration of spiritual cleansing. If, Peter had experienced the cleansing of salvation once. He did not need to be washed again in the spiritual sense. Salvation is a one-time act of justification by faith, but the lifelong process of sanctification is one of washing from the stain of sin we experience as we walk through the world. Peter and the disciples—all except Judas, who never belonged to Christ—needed only this temporal cleansing. Point 3. For us – a symbol of our care and service towards one another. This truth is just one of several from this incident that Christians can apply to their own lives. The first lesson to learn from John 13 is this. When we come to Christ for the washing of our sins, we can be sure that it is permanent and complete. No act can cleanse us further from our sin, as our sin has been exchanged for the perfect righteousness of Christ on the cross. But we do need continual cleansing from the effects of living in the flesh in a sin-cursed world. The continual washing of sanctification is done by the power of the Holy Spirit, who lives within us, through the “washing of water by the Word” of God, given to us to equip us for every good work. But there is a second thing. 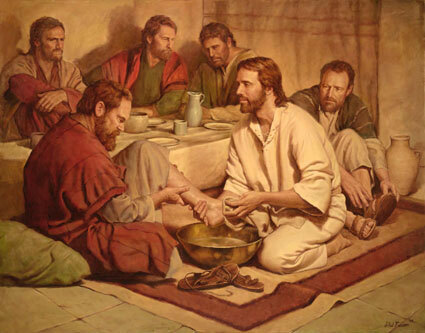 When Jesus washed the disciples’ feet, He told them (and us) in John 13:15 (ESV) “15 For I have given you an example, that you also should do just as I have done to you.” So, as His followers, we are to emulate Him, serving one another in lowliness of heart and mind, seeking to build one another up in humility and love. When we seek pre-eminence, we displease the Lord who promised that true greatness in His kingdom is attained by those with a servant’s heart. Then, the Lord promised, if we serve we will be greatly blessed: John 13:17 (ESV) “17 If you know these things, blessed are you if you do them.” When someone claims to be a Christian and if someone claims to be in union with God and union with Jesus Christ, possessing eternal life, we are instructed here to examine the character of their love life, for therein lies the proof of their claim. Christians who are genuinely born of God manifest that transformation by means of righteousness and love. Those are the two basic behavioural tests, the two measurements of conduct. So, Christ wants foot washers, and He set the example and today we are challenged to be foot washers. Now obviously we are not in need of our feet washed, and let me say this, that all this symbolic foot washing that we see around the show is nothing but symbolism, and symbolism might heal some emotional wounds as in the Vlok case, but it is actually highly impractical. Foot washing was a downright practical issue fitting their culture and historical context. Let me just make my point a bit stronger. Let’s say you are going through a major trial in your life, whatever it is, and I rock up with my basin and towel and I wash your feet, what have I really done for you. All I did is to remind you of the humility of Christ. I believe that today, foot washing takes on many forms. But there are many ways we can wash each other’s feet. Now I am not going to belabour the point. But we all are aware that the New Testament is filled with what we call “Biblical One Another’s.” These are things we are taught to do for each other. Let me quote you a few verses to stimulate our minds and then realise there are many more. I read somewhere that there are at least 45. I am going to give you 38 this morning. Let’s start with two key verses from John 13. John 13:14 (ESV) “14 If I then, your Lord and Teacher, have washed your feet, you also ought to wash one another’s feet.” And then John 13:34 (ESV) “34 A new commandment I give to you, that you love one another: just as I have loved you, you also are to love one another.” This commandment to love one another is repeated in John 15:12 & 17 and many, many other places throughout the New Testament, so I am not going to quote all the verses on loving one another. Romans 15:7 (ESV) “7 Therefore welcome (or accept) one another as Christ has welcomed you, for the glory of God." 1 Thessalonians 5:13 (ESV) “Be at peace among yourselves (with one another)”. May God give us the grace to apply the above, and to open our eyes further by His Spirit to reveal areas in which we can wash each other’s feet? Let me just say this in closing. To refuse to follow Jesus’ example of humble service is to elevate oneself above Christ, and heaven forbid that we ever do that. So let’s go and imitate Christ. Let me end with one of the golden texts regarding this topic. Ephesians 5:1-2 (ESV) “Therefore be imitators of God, as beloved children. 2 And walk in love, as Christ loved us and gave himself up for us, a fragrant offering and sacrifice to God.” Do you realise that as you take up the ‘Biblical One Anothers’, when you lower yourself and start washing feet as a servant, even when man frowns upon your actions, it is a sweet smelling sacrifice to God.